Aims: The aim of this study is to investigate the effect of yoga therapy and its influence on blood glucose parameters in patients with type 2 diabetes mellitus. Materials and Method: This was a prospective study conducted at Diabetes Centre, KLES Dr. Prabhakar Kore Hospital and Medical Research Centre, India, from January 2016 to December 2016. A total of 1000 type 2 diabetic patients were enrolled in the study with informed consent. We assessed the patients for pre- and post-assessment blood parameters after a period of 12 months for fasting blood sugar (FBS), postprandial blood sugar (PPBS) levels, glycosylated hemoglobin (HbA1c), cholesterol, and triglycerides. A qualitative in-depth interview of the participants and therapist was conducted at baseline, end of 6 months, and end of 12 months. Statistical Analysis: The observations were recorded and analyzed for significance using SPSS version 20.0 statistical tool. Results: During pre-assessment, the results revealed an increase in the level of FBS (181.75 ± 71.47), PPBS (262.04 ± 97.23), HbA1c (10.30 ± 5.3), cholesterol (180.13 ± 47.1), and triglycerides (159.77 ± 110.39). However, the participants who completed the yoga therapy had significantly lower FBS (133.01 ± 46.98) (p < 0.0001), PPBS (187.67 ± 68.61) (p < 0.0001), and HbA1c (7.89 ± 1.6) (p < 0.0001) at the end of the 12th month. There was statistically significant positive correlation observed in yoga group as compared to the control group during postassessment blood parameters. Conclusions: The results of the present study demonstrated that yoga is effective in reducing the blood glucose levels in patients with type 2 diabetes mellitus. Our study also showed positive benefits of yoga in the management of diabetes with real impact on glycemic control and lipid profile. Background: The art of learning may contribute to various skills required for better performance in human abilities involving memory, learning (attention fluctuation, sentence completion, and general intelligence), perception, motor functions, etc. 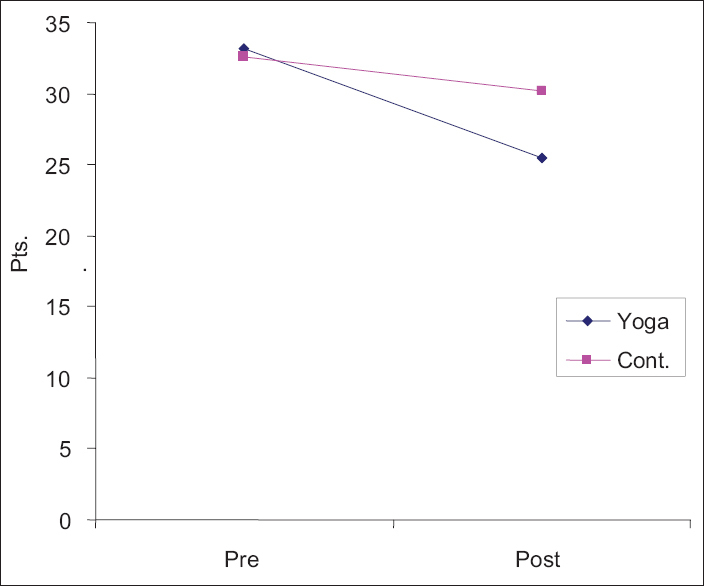 Objective: This experiment was conducted to evaluate the efficacy of yoga training intervention toward improvement in the selected psychological correlates of learning ability among the school children. Method: A parallel group, research design was considered in this experiment, which was conducted on sixty male students (n = 60), age group of 12–14 years, who were randomly assigned into two identical groups (Group A: exp group and Group B: control) and each group consists of thirty students. The research design includes pretest, yoga training, mid-test, detraining, and posttest. The variables of learning abilities (viz., attention fluctuation, sentence completion, and general intelligence) were tested three times (pre-, mid-, and post-) using standard methods. The yoga training intervention comprising prayer recitation, Yoga Asanas, Anuloma Viloma (Pranayama), and Omkar Chanting was imparted for 45 min daily in the morning (except Sundays and holidays) for a total period of 45 days, whereas the controlled students were kept busy with recreation and library readings. Then, mid-test was conducted. Further, the detraining phase (Phase II) was considered for the next 45 days, and then posttest was conducted. 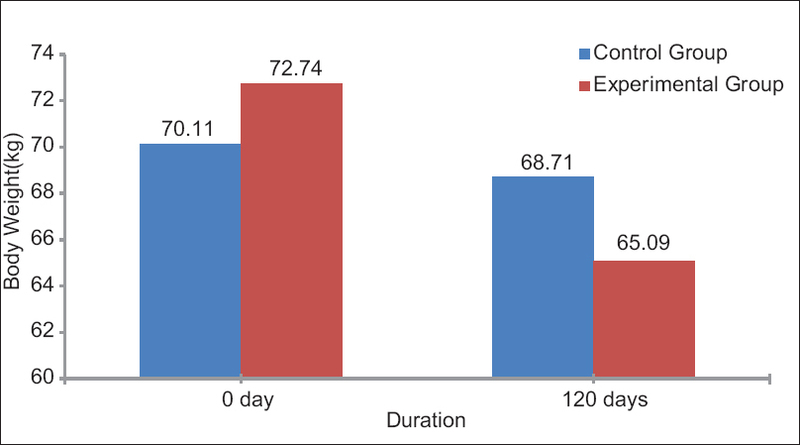 Thus, total duration of the experiment was 90 days. Statistical Analysis: All statistical analyses were carried out by 2 × 3 × 3 factorial ANOVA followed by Scheffe's post hoc test. Result: The results revealed that Hatha Yogic practices lead to the reduction in attention fluctuation which implies improvement in attention ability among the school children. Further, improvement in sentence completion ability and general intelligence was evident after yoga training intervention. Moreover, detraining phase of 6 weeks could maintain similar trend of results as compared to the controlled subjects. Conclusion: Hatha Yogic practices lead to a significant improvement in the selected correlates of better learning ability in school children. Background of Study: The Indian school education system is textbook-oriented that focuses on rote memorization of lessons and demands long hours of systematic study every day. The elaborate study routines that are expected by high school students span from the morning to till late evening hours, leaving little time for socialization, recreation, play games and sports by full strength. Objective of Study: The present study was conducted with a view to see the effect of Sahaja Yoga meditation on stress among school children. Materials and Method: Non-equivalent control group design was used for this experiment. The participants were 8th grade students from a school located in Mumbai. The students were randomly assigned to control and experimental groups. Experimental group received the treatment of Sahaja Yoga meditation program for 6 weeks, whereas the control group did not receive any treatment. Both groups were free to do their daily routine activities. Stress was assessed using a questionnaire before and after 6 weeks of Sahaja Yoga meditation program. Statistical Analysis: Collected data were analyzed with the help of the standard statistical technique t-test to conclude the investigation. Results: The results of the study showed a significant difference in academic stress (p < 0.05) after 6 weeks of Sahaja Yoga meditation program. However, there was no significant improvement in academic stress (p > 0.05) in the control group. Conclusion: Sahaja Yoga meditation program is helpful to manage the academic stress of school girls. Background: Overweight is a big problem for sportspersons. Excess body weight affects sportsperson's skills and performances. Excess body fat in sportspersons also increases the risk of heart disease, diabetes, liver disease, arthritis, and allied problems. Objectives: This study was designed to assess the impact of yoga–Preksha meditation on obesity in sportspersons. Materials and Method: The participants were selected randomly from the Physical Education Department of Chaudhary Devi Lal University, Sirsa. Totally seventy students were incorporated in the study. They were divided into two groups of 35 each. Group I was termed as “experimental” and Group II was considered as “control” group. The experimental group was progressively introduced to the selected yogic exercises and Preksha meditation. The practice session was conducted for 60 min on all weekdays except Sundays for a period of 4 months. Control group was not given any such training. Pre data (0 day) and Post data (after 4 months) of both groups i.e. height, weight and body mass index (BMI) was taken. The difference in the percentage of participants improving in the experimental group and the corresponding control group was tested for significance of difference by computing Student's t-test. Results: The results showed that there was a significant reduction in body weight and BMI in experimental group which may be attributed to the dominance of parasympathetic component of autonomic nervous system and simultaneous balance in the stimulatory activity of sympathetic components too. This might have caused alteration in fat mobilization which resulted in reduction in body weight and BMI. Conclusion: The regular practice of yoga–Preksha meditation is helpful in managing the problem of obesity in sportspersons and improves their performance. Background: Anuṣṭhāna Yōga Vedānta (AYV) is a comprehensive system developed by Yogacharya Raparthi Rama Rao, who attained the state of jīvaṇmukti (liberated while living). He was the spiritual head of Yoga Consciousness Trust, Vizinigiri, Andhra Pradesh, India. AYV comprises two integrated parts of yōga and vedānta emphasizing on the applied aspects of both. Aim: The aim of the current study was to focus on exploration and analysis of the AYV methodology and techniques. Method: Extensive review of five books written by Yogacharya in English represent the AYV method. One of the books was on biographical details of Yogacharya including his selected works and letters. The researcher attended lectures, listened to compact disc recordings, and interacted personally with Yogacharya for clarification and correction of concept and methodology of AYV. Results: Anuṣṭhāna Yōga is the amalgamation of Karma, Bhakti, Maṇtra, Kuṇḍalini, Jñāna, and Rāja Yōgas. All these yōgas are practiced in a systematic manner, initially with a focus on attaining the biṇdu or chaitaṇya darśan, and then practicing to be in the awareness of the chaitaṇya. Anuṣṭhāna vedānta deals with imparting knowledge that helps in analyzing and realizing the nature of one's true self. Conclusion: Yogacharya developed a systematic methodology of achieving the objectives of yōga and vedānta, which is tailored to the needs and levels of the modern person and is a surest, swiftest, and safest method. The stage-by-stage learning process of AYV guides all types of sādhakas in a phased manner and helps them progress to reach the goal. 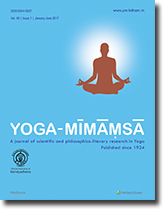 With increasing popularity of yoga as a preventive health practice and therapeutic modality, issues regarding its safety have been analyzed in the scientific literature. Overuse, injury or strain, and sprain are some adverse effects that may be attributed to faulty yoga practice. However, traumatic dental injury as a result of fall during yoga practice is rare and unusual. This article presents a case of an 11-year-old female who fractured her permanent central incisor while practicing yoga posture Kukkutasana (cockerel pose), the arm-balancing posture. She underwent root canal treatment for the fractured tooth followed by restoration with post and core crown buildup. Yoga is known as a source of healing since ancient time, which should not cause any harm. It is recommended to adopt appropriate safety measures while performing yoga practices so that the detrimental physical, psychological, and financial consequences of preventable traumatic injuries can be avoided.